On Sunday night, Odell Beckham Jr. made one of the most incredible catches you’ll ever see in the Giants loss to the Cowboys. The catch could be found within minutes all over the internet and will be sure to live on in highlight reels for eternity. After watching the play for what felt like the thousandth time, I couldn’t help but feel a similarity to the Endy Chavez catch in Game 7 of the 2006 NLCS. It’s not easy for me to think about the 2006 NLCS. Typing this post has brought back all sorts of bad memories. Game 7 was one of those nights where all Mets fans can tell you where they experienced that misery. As for me, I watched at a bar called Reefers in Federal Hill, Baltimore while I was still attending Towson University. I remember it like it was yesterday. With the game tied in the sixth inning Scott Rolen tattooed a ball to deep left field, it appeared that would put an end to the Mets World Series hopes and dreams. Endy Chavez tracked that ball at full speed all the way back to the warning track, leaped up and slammed his body against the wall while putting his arm out to its full extension. Somehow, someway, Chavez was able to snag it a few feet over the fence. When he landed, he had to take a double-check into his glove, as I think he was in as much disbelief as the rest of us that he had actually made that catch. He then quickly fired it back into the infield and the Mets were able to double Jim Edmonds off of first base for an inning ending double play. It was a surreal moment. There was no way the Mets were going to lose that game. Then the unthinkable happened. It started with Yadier Molina hitting a two-run home run in the ninth inning off of Aaron Heilman, well out of Chavezs’ reach this time. As if that wasn’t heart breaking enough, the Mets went on to load the bases in the bottom of the ninth for Carlos Beltran. Beltran, had already established himself as a great postseason performer, earning his contract with the Mets after going on a tear just a few Octobers earlier with the Houston Astros. But wouldn’t you know the Mets luck, Beltran went down looking at a 3-2 curveball from rookie Adam Wainwright. Although Beckham JR’s catch was made in the regular season for a flailing Giants team, it will still be remembered as an all-time great play. Chavez on the other hand, went from making arguably the greatest catch in postseason history, to making the greatest catch that also brings about the greatest amount of heartache to its fan base. I will always remember it as a bittersweet moment in Mets history. Ultimately both the Giants and Mets lost those respective games. I do have to give the edge to Chavez simply because of the situation in which he made his. But the ultimate goal is always to win the game, after all, these are teams sports. 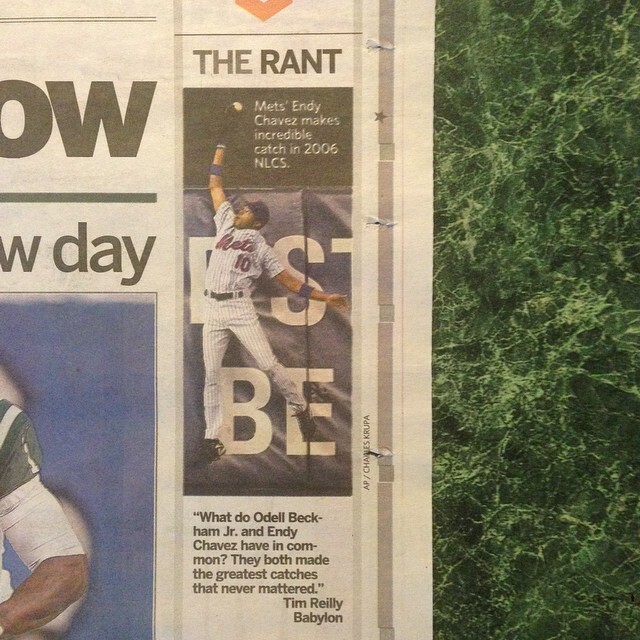 For that reason alone, these will both be known as the greatest catches that never really mattered in NY sports.